February 24, 2011 - Repairs have been completed to the Mt. Orne Bridge in Lancaster, NH. The bridge was damaged as a result of truck collision damage when an oversized tractor trailer drove through the bridge on May 26, 2010. Damage was caused to the upper lateral bracing, truss chords and portal siding. The bridge was closed by the Town of Lancaster, the bridge owner, on the recommendation of the NHDOT. Through their insurance carrier, the New Hampshire Property-Liability Trust, the Town hired the consulting engineering firm of Dubois & King, Inc. to evaluate the damage and outline steps to initiate repairs to the bridge. Barnes & Bridges of New England was selected by the Town as the contractor to make the repairs. "The upper lateral bracing and some truss chords took some very big truck hits" says Robert H. Durfee, P.E., Vice President for Dubois & King. "Repairs were initiated that preserved as much of the original bridge fabric as possible"
"We tested the existing timber used on the bridge, and found it to be Southern Pine. We installed all replacement members and truss repairs using Southern Pine Dense Select Structural Grade", say Tim Andrews, President of Barns & Bridges. The bridge remains closed and barricaded to vehicle and pedestrian traffic. Field observations by the NHDOT and Dubois & King discovered decay (rot) in the truss connections (compression members) and up to 4" of sag in the trusses on the Vermont side. It was determined that these problems were not caused by the truck collision. The Town will keep the bridge closed until repairs to the trusses can be made. The Town is currently seeking grant monies to perform a complete rehabilitation of the Mt. Orne Bridge. The Mt. 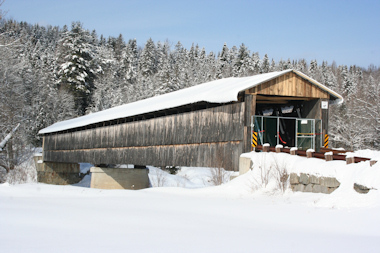 Orne Bridge was constructed in 1911 using Howe type trusses. It is a two span structure, with an overall length of 266 feet. It spans the Connecticut River and connects Lancaster, New Hampshire with Lunenburg, Vermont.